Business on-line has exploded in recent years and is expected to triple and quadruple in the next few years, changing the way we shop, communicate and live our lives. Here at Data Synthesis, we believe the Internet and related information technologies will ultimately transform our culture in ways reminiscent of the Industrial Revolution. Ecommerce on the web is growing at phenomenal rates, is expected to continue to grow, and is the most promising area for those wanting to go into business for themselves. Indeed, the opportunities for the home-based entrepreneur are boundless. With a little vision, a little work, and a little patience, you can reap huge rewards. We are keeping our eyes on the trends in ecommerce and cybermarketing and have already begun to prepare for shopping in this new millennium. We hope to give you the information and tools necessary to make your on-line business successful. If your business does not yet have a web site, you are missing a huge opportunity to grow your business. According to a recent study approximately one-third of small business in the US are now on-line and 40 percent of small businesses without web sites (approximately 2.1 million) expect to be on the Internet within an average of the next eight months. Primary uses of the Internet cited by respondents were: promoting to prospects (69 percent), ecommerce (57 percent), providing better customer service (48 percent), competing with other businesses (46 percent) and communicating with employees (11 percent). The companies that will fare best in the coming years are those riding the cutting edge of technology. Tech-savvy companies that recognize this future in business and go on-line now are in a position to grow with the Web, and expand and enhance their sites as the technology matures. Those who fail to embrace this new technology will cease to be effective players in the marketplace. If you have a small or home based business and aren’t on the web you are missing out on an extremely cost effective method to reach a global market place, showcase your products and services 24 hours a day, increase your customer base and increase your profits! Both customer service and order-taking are cheaper on the Net. Internet inquiries are two-thirds less expensive than telephone queries. Understand that the Web is a replacement of nothing. It is to add additional value to your current marketing plans. Any business that could benefit from advertising, could benefit from a presence on the Internet. For the small business the Internet is increasingly providing a growing market for their products and services. The costs of advertising and offering products world wide have long favored the deep pockets of big businesses. Now, using the World Wide Web small businesses can offer products and communicate with vendors and suppliers at costs easily affordable. Internet marketing is the only two-way communication available today, unlike other marketing methods. The Web gives commerce unique opportunity to communicate directly with employees and customers around the world. The Web can be a powerful tool for fostering connections, building association, delivering information and creating on-line communities. A web presence is a lot cheaper than direct mail, and when combined with a direct mail campaign, can greatly amplify results. Send your newsletter or product updates to your prospects electronically in less time and for less cost. You save money on printing, shipping, mailing costs! Publish your sales materials and product information at a fraction of the cost by making them available at your web site. Generate leads for your business at a lower cost. Anyone can access basic information about your company 24 hours a day 7 days a week and get up to the minute information on your products and services. You don’t have to pay employees to “man” your Internet store. Shoppers can come and go at their convenience and have fingertip access to your service and product information. Visitors coming to town can now log onto their local Internet provider wherever they are and see what services are available to them before they arrive. Accept orders for your product online. Credit card transactions are currently unsecure but you can request the customers phone number to complete their order. By using Forms on your Web Page you can collect information on the visitors to your site and add them to your regular mailing list. The number of people online, the variety of sites and the amount of data available on the Internet has experienced explosive growth and it would seem it is only beginning. By having a web presence strategy in place during its early development, you will have a leg up on the competition. Everyone venturing onto the Web needs tools to help them succeed. We have gathered here some useful tools to help you better sell your products and services. Below you will find links to shopping carts, credit card processors, and other tools for doing business on the Internet. 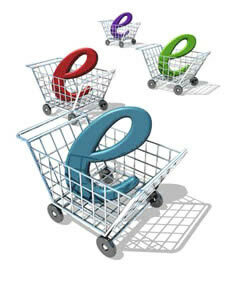 Click Here to try the World’s Smartest Shopping Cart system. Yahoo Store – An easy way to open an online store.